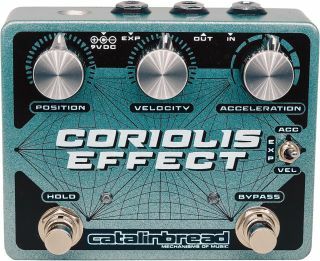 Catalinbread has unveiled the Coriolis Effect, a multi-pedal that acts as a “sustainer, wah, filter, pitch shifter and harmonizer rolled into one,” according to the company. The new pedal features three main knobs to alter the guitar signal: Position, which controls the dry/wet mix; Acceleration, a two-pole low pass filter; and Velocity, which adjusts the pitch of the wet signal. There’s also a Hold switch to stop new sampling and loop the current signal, an expression pedal input, internal bypass mode switch that can be set to either true-bypass or buffered bypass, and internal controls to set expression pedal polarity and gain level. The Coriolis Effect is available for $229.99. For more information, head over to Catalinbread.com.